English Ivy is the most wide spread invasive plant in Stanley Park. When allowed into our wilds, it chokes out the native understory creating a mono-culture. Its ground cover displaces all annual greenery and prevents replacement trees from sprouting. It propagates primarily by being physically transported by vehicles, bikes, walkers, and importantly, by workers' equipment. Only a small piece of root or even a leave is sufficient to start a new plant. Once started, it can grow ten feet in diameter each year. Once growing up vertical structures and trees, it flowers and propagates with seeds. Its growth becomes much more vigorous and a large tap-root can usually be found directly under the tree's base. Ivy weighs down the trees it climbs making them more liable to break, especially in wind. Once that tree falls, the vigorous growth continues, now growing widely. Most of the large patches I have found in Stanley Park appear to either a) have radiated from a fallen tree with climbing ivy or b) have been started by the lumbering activities of work crews. Many sites on the web claim that ivy grows up a tree trunk in a spiral. They claim that as the tree trunk expands these spirals squish the tree's 'circulation' causing branches to die. I have never seen any evidence of this. In Stanley Park the ivy grows straight up trees, not in a spiral. I have not seen dead branches under heavily loaded trees. Yes there have been fallen trees with evidence that they had a full load of ivy before they fell, but trees fall for a lot of reasons. I have no idea where this much-repeated idea comes from. Most comments I receive from passers-by imply this is a "fool's errand" or impossible objective. No so. By myself, I have cleared all the red areas on west side of the map below. With help, we could completely finish the wild, west half of the park. The claims that clearing ivy "requires years of maintenance and replanting with native species" is garbage. Native plants spring up within months, and careful, complete pulling does a permanent job. A quick walk through to find the last remaining pieces a year later is the only follow-up needed. To get the greatest 'bang for your buck' start with the cleanest areas - pick individual spots that will sanitize large areas. This concept is like the doctor whose patient has lung cancer - one lung completely black, but the other with only a small, but growing spot of cancer. He has only one chance to operate, so he chooses to clean the one spot and save that lung. Removing the equivalent area of the black lung would do nothing to save the man's life. To be sustainable, clearings must be surrounded by a barrier that prevents new contamination. Roads and trails are effective. By clearing areas adjacent to those previously cleared, the boundary and source of new contamination is minimized. So build your cleared area incrementally larger and larger. Only large areas can be considered to have any 'ecology'. Only wild areas can be considered to have any 'ecology' for saving. Ivy growing in your garden is not an ecological problem - it is no different from every other 'unnatural' plant you cultivate. Yes, the ivy in cultivated areas becomes the source of contamination in the wilds, but when the wilds are already contaminated it causes no incremental problem. Inventory your section before early April. After that, leaves will obscure the ivy. Check out all opening, and trails and foot-paths. There is much more going-on inside the trail sections than you are probably aware of. Try to grid-search open gladed areas. Walk the trails looking at only one side at a time. There is frequently only one leaf showing that causes you to stop and investigate. Raise your sights and look into the woods for ivy growing up trees. Start pulling a patch by working from its back edges. You will be more painstaking when you are still fresh. This will also leave the tell-tale plants where they can be seen from the front. Coil the vines around your hand, and stuff into the garbage bag. Do not leave them on the ground. They WILL re-root. Wherever the ivy has rooted securely use a stick to dig up the root. Do not just yank and let the root disconnect. In open areas you can start in the middle and grasp multiple vines at once, and coil first one side, and then another. Grabbing more than 3 vines won't work - you'll see. Dump your garbage bag at a compost pile off the road and preferably out of sight, to prevent vandalism. It is not necessary to pull down all the ivy that is climbing trees. Simply cutting the stem at the bottom does the trick. The growth above will dry out and fall on its own. Trace all the stems at the bottom of the tree to make sure you have pulled up all the taproots. Work your fingers around the under the root ball to pull it up. If it will not come, dig down and tackle each individual root section separately. If a taproot refuses to come up, cut it off with a knife or keyhole saw as deep as possible. Bury the cut end with soil and pack it hard with your boot. This seems to kill the root. Where ivy grows under grass or gravel along the trail, it is necessary to use a stick to clear a path for the ivy to be pulled up. Sanitize the site when you are finished. Pick up all the leaves with intact nodules that can re-root. Remember that this work will be done only once, so it must be complete. Don't allow stems to break and leave the remains underground. This should not be a make-work-project. Do it once and do it right. Don't try to create a carpet roll. Many sites on the web talk about removing Ivy by rolling it up like a carpet in one long roll. You only have to try this once to find out it does not work - except in very limited circumstances. It will NOT work in the wild. The roll is easy to start but within two yards its size become too huge and heavy to roll, much less pick up and move to any compost pile. It is also difficult to end. All the continuing stems must be cut, creating the probability that they will be left underground to regenerate. Those remaining stems must now be cleared to make room to roll the log over one more time to pull up the remaining roots left underneath it. There there is the issue of plants in the path of the log that should be left in place. In the wild there are almost always at least ferns that must be left. There is no way to roll up ivy without destroying these as well. 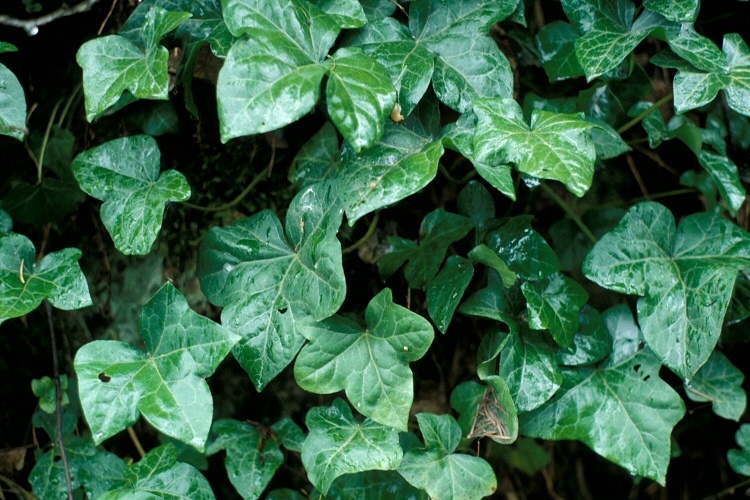 Consider also that in the wild Ivy grows over and under and around fallen branches and logs. There is no way to roll up ivy with these in place. And it is hard to remove them before at least some of the Ivy has been cleared to free them for lifting. What with all the fiddling you will find that it would have been quicker and more complete to simply pull the Ivy strand by strand, and forget the carpet roll. Don't remove ivy growing up trees. Do not cut or remove ivy growing up trees without also clearing all the ground ivy, unless the ground ivy can (and will) be clearly seen. The tree-ivy is the easily seen visual clue that ground-ivy exists. Once removed, the remaining ground-ivy will easily be missed. Leaving the ground ivy guarantees that this make-work-project has replacement tree-ivy growing again within years. As discussed at the top of this page I have not seen evidence of tree-ivy's extra destructive force. The fact that tree-Ivy sets flowers and creates seeds is also not a problem I have seen. Only three patches in the wild west of the park seemed to have come from seeds. There were thousands of individual small plants (instead of the normal limited number with long streaming stems). Of those three sites, only one had tree-ivy growing above that may have flowered. The other site never had. So even on these two sites I am not certain the plants started from seed. Plants found but not yet removed. There is a huge plant growing high up a nearly dead stump/tree. See the Red dot on the map below. Walking DOWN the hill on Thompson Trail - just before it becomes steep. Look a bit inland on your right (the South). I pulled up the roots quite a while ago, but it is not dying. It must have become self-supporting on nutrients caught in its high crotch. The Green dot on the map above was recently found during upkeeping. It is now the top priority. The white area has never been cleared. It is 100% covered in Ivy. It was at this point I made Blackberries my priority for new work. Pullings left beside the road for pickup get vandalized, so it is necessary to deal with the pullings without staff help. Tightly wrapped, compact coils compost by themselves if piled and turned once or twice a year. The piles disappear within about 3 years. They work best in dappled shade with a bit of shelter from rain. After pulling ivy for the 45 minutes (to an hour) necessary to fill a bag, you will be thankful for an excuse to stand up and walk around - so a central compost pile a little ways away is not a bad thing. A claim seen frequently on the web is that English Ivy will not compost. They never clarify but It is my guess that either a) they are just repeating what they read elsewhere on the web, or that b) they are referring to adding ivy to your 'normal' compost pile. Garden composts do their work within one year. Ivy takes longer than that so yes, it should not be added to your 'normal' compost pile. But a pile of just Ivy, layered three bags high, will indeed compost itself. Once cleared, there is no re-growth and very few new infestations. The cleared sections need to be revisited every 5 years or so. My first 3-year upkeep was a waste of time - too few plants for too much time spent looking for them. Upkeep must be done in early spring for the best visibility - before new leaves appear and after last year's leaf-fall has decomposed. I am continuing to find spots that are clearly old enough to have existed, but been missed, in the original clearing. Mostly this is just a tramp in the woods. Barely 5 minutes in every hour is spent actually picking Ivy when some is found. You don't see the stuff unless you are right on top of it, so complete coverage of all accessible areas is necessary. Empty your bag of pullings in the nearest garbage can. It is not worth starting a compost pile for the small volume . Or if you are close to the outer boundary of the cleared area, just dump your bag of pulling on top of an existing ivy patch.